I'm really tired after today's basketball practice. I can feel beads of sweat making me gleam in this bright noon sunlight. The school, homework, next week's exam and inter-school basket ball match: thinking about all this is making me sick and the hot weather is cherry on the top of all this mess. My feet feels heavy to move. I'm staring down at the grayish-black road and hoping to magically reach home soon. Cars are passing by but I continue to look down. 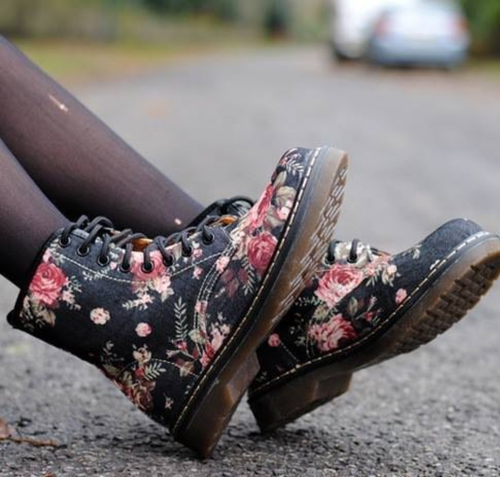 After some time when I finally lift my gaze, there I see her feet, with floral print, fancy black boots on. It was the first time I saw some girl sitting on road, waiting for something, or maybe someone. As I was about to see her face, I hear another girl's shout from other end of the road "Anna lets go!!" And the next thing I see is the fancy boot girl getting up and running towards the sound in full speed. I'm trying to get a glimpse of her face, but all I manage to see is her long, wavy, dark brown hairs covering her face and slightly flying in the wind of her speed. She appears like a free bird flying with no worries, no stress. I can hear her lively giggles as she runs farther away from my side. I notice that all this time I was smiling & standing still, and I don't remember when exactly I stopped. I saw her disappearing in the roadside apple orchard. I started moving again, but this time my mind is busy thinking about her. I adore her, her wavy hairs and those black fancy boots. Strange, I don't even know her. Its evening now and I still can't stop thinking about her. Who is she? Will I ever get to see her again? Do I know her?! All my other worries are already crushed by her fancy boots and in my mind I'm replaying the scene again and again. I want to meet her, I don't know why, but I really want to. Its crazy but lovely, I feel queerly attracted to a girl whom I have barely seen. All I know about her is her name is Anna, or at least that is what her friend calls her. What is this feeling? I have no idea. But now I want to find "Miss Fancy Boots", the girl whose thoughts make my smile! i'll write that soon :D ! Good one, Crimson curls :) Waiting to read what happens next!